The non-returnable charge for lodging a Registration form. Please note the registration fee applies separately for each school. a. The Acceptance deposit is payable on return of the completed Acceptance Form. A term’s fees applicable at the time of entrance (less deposit/s held) will be immediately payable by the parents if, for any reason, they cancel their acceptance of a place less than a term before entry or the pupil does not join the School after a place has been accepted. The Sixth Form Place Acceptance Deposit will be fully refunded if the pupil fails to meet the School’s entrance requirements. b. Places for 13+ and 14+ including Belmont, Mill Hill Preparatory School. This deposit will be repaid as a credit without interest after the final payment of the fees, or other sums due to the School on leaving. c. Places in the Sixth Form. This deposit will be repaid as a credit without interest after the final payment of the fees, or other sums due to the School on leaving. Tuition Tuition fee also includes additional charges for curriculum expenses and additional contributions towards basic sports trips and visits. Parents will be notified of any additional charges related to Transportation, extra-curricular activities such as residential trips, exam charges, lost books, (this list is not exhaustive).The additional charges will be added to the School bill and are payable upon receipt of the bill. 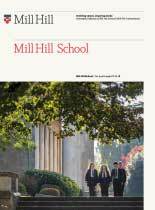 A full terms fee may be applicable in accordance with The Mill Hill School Foundation Standard Terms and Conditions in the circumstances where a pupil is being withdrawn from the School prematurely and without proper notice. Payment Arrangements The Foundation prefers that tuition fee invoices be paid by Termly Direct Debit. Payment can also be made by direct bank transfer. International parents can also make payments using online portal (www.flywire.com). Due Date Each term’s invoice for fees and extras is due for payment by the first day of term. Late Payments Late payment Charge on Overdue Accounts are applicable in accordance School’s Standard Terms and Conditions.